You are here: Home » Is Gluten-Free the Way to Be? The hype surrounding gluten-free diets has been growing. We have all heard about these on the news as well as celebrity endorsements (Chelsea Clinton’s gluten-free wedding cake), but what are they, really? What do they entail? And what exactly is this “gluten” we keep hearing about? Well, in honor of Gluten-Free Diet Awareness Month, ChefUniforms.com has decided to answer these questions for you! 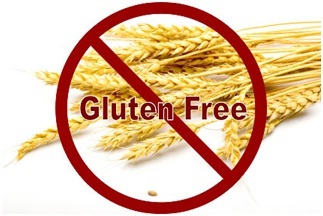 Gluten is the protein that is found in wheat, barley and rye that makes our favorite foods so much better. It makes pizza dough stretchy, bread spongier, and thickens sauces and soups. In other words, gluten binds different foods together, so that they create something new (and delicious). There are people who have a chronic digestive disorder, called celiac disease, in which even a tiny crumb of gluten can make them sick. So, for these people, gluten-free is the only way to be! As the ability to test for this disease became easier, more and more people became aware of why they felt ill after eating a piece of bread. A new issue has emerged, called nonceliac gluten sensitivity, which leads to similar symptoms (stomach cramps, diarrhea, and bloating). Unlike celiac disease, with nonceliac gluten sensitivity, the intestine remains undamaged. After the food companies realized that there was a new, growing market to be targeted, more and more people began avoiding gluten in order to cure migraines, fibromyalgia, and chronic fatigue syndrome. There is also the idea out there that a gluten-free existence leads to rapid weight loss. However, without the gluten to bind our food together, food manufacturers are forced to turn to more fat and more sugar to make the product better tasting. What would a Gluten-Free Diet Entail? Pretty much all bread products, unless they specifically state “Gluten-Free” on the package. *Read your food labels for ingredients that might contain gluten! So, is Gluten-Free Really the way to Be? This one’s tricky. If you suffer from one of the illnesses listed above, then definitely yes. However, if you just heard on the news that it’s the new thing to do and you might lose weight, it might not be for you. First, it’s very difficult to maintain (you can see how many everyday products contain gluten above). Second, you could end up with nutritional deficiencies (like iron, B Vitamins and fiber) – many people replace their vitamin-enriched and whole grain foods with gluten free foods, and miss out on all of the stuff that’s actually good for your body. On the other hand, if you skip some of the “gluten-free” products and stick to eating more vegetables, fruits, lean protein and dairy products, a gluten-free diet might be a very healthy way of eating. It’s all in how you plan your meals. Can you name some easy ways to stay gluten-free and healthy? Leave a comment below!